Make no mistake, Meghan Markle is much more than Prince Harry's new girlfriend. The Toronto-based actress has proved time and again she's got both brains and beauty. In a new essay published in Elle UK on gender equality, the 35-year-old wrote about her desire to use her celebrity to "spark change." Markle is an advocate for UN Women and an ambassador for World Vision. "Were it not for my show and website, I would never have been asked to be a global ambassador for World Vision or an advocate for UN Women, both of which are honours I relish," she wrote in the personal piece. Markle went on to say that while most people are starstruck by actors, her idols are those who effect change like diplomats and politicians. Markle credits her mother for raising her to be a "global citizen." Markle began her activism at an early age. Early into the essay, she recalled a scenario that drove her desire for change at the age of 11. "A dish-washing liquid commercial came on a TV with the tagline, 'Women all over America are fighting greasy pots and pans.' The boys yelled out, 'Yeah, that's where women belong. In the kitchen,'" she wrote. Markle acknowledged the fighting spirit she had back then hasn't changed, but her platform has. "The moment 'Suits' became successful and I realised people (especially young girls) were listening to what I had to say, I knew I needed to be saying something of value," she admitted. This realization led to the creation of her lifestyle website, thetig.com which includes thoughtful pieces from international influencers as well as mainstream topics like fashion and beauty. 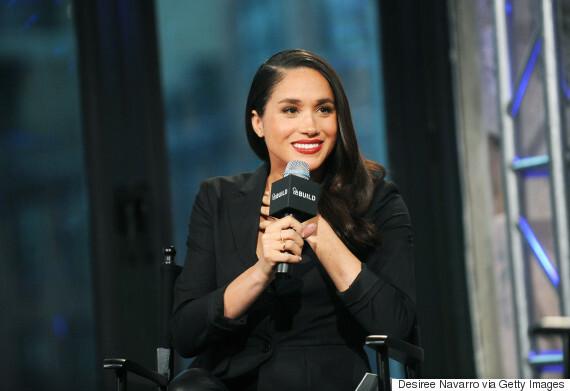 Concluding her essay, Markle stated, "With fame comes opportunity, but it also includes responsibility – to advocate and share, to focus less on glass slippers and more on pushing through glass ceilings. And, if I'm lucky enough, to inspire." Actress Meghan Markle discusses her role in the very popular 'Suits' during AOL Build at AOL Studios In New York on March 17, 2016. This isn't the first time Markle has written a personal piece for Elle UK. In 2015, the "Suits" star wrote about finding her identity and voice as a mixed race woman. MORE: Living Meghan Markle meghan markle activism meghan markle advocacy meghan markle essay Meghan markle gender equality meghan markle glass ceiling meghan markle on gender equality Meghan Markle prince harry meghan markle suits meghan markle UN prince harry dating meghan markle Prince Harry Meghan Markle video Who is meghan markle?